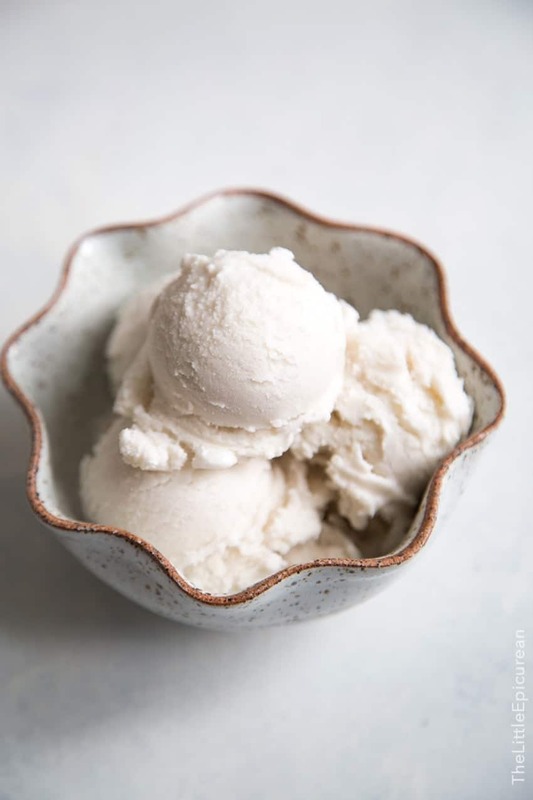 This dairy-free coconut ice cream tastes like a tropical vacation and it’s the easiest ice cream I’ve ever made. Even without using any shortcuts, this is the simplest ice cream I’ve ever made. You mix all ingredients in a blender and then pour it into an ice cream machine. Done. That’s it. Today marks my last full day in Hawaii. I’m sad to leave paradise but I can’t stand to be away from the dogs for more than a week. I’m ready to be reunited with Charlie and Taylor. I’ve picked a few treats and I’m super excited to share it with them. This coconut ice cream is rich and creamy and oh so delicious. Coconut is a definitely my spirit fruit. I grew up eating all things coconut and I have yet to tire of it. So many Filipino foods (sweet and savory) use coconut in some application. Ginataan, cassava cake, buko pie. My mouth is watering just thinking about it. One day I’ll learn to make all of it, but for now, I’m all about this coconut ice cream. The recipe is an adaptation from Minimalist Baker. Have you checked them out? They’re a husband and wife team that makes amazing yet simple recipes. I love them. 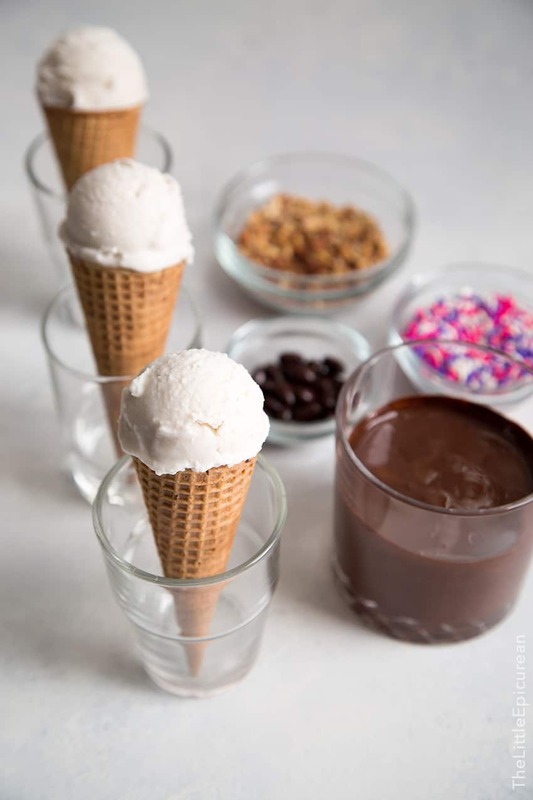 Asides from my eternal love for coconut, the real reason I made this ice cream is to build coconut sundae cones! It’s like a Drumstick but tastier, dairy-free, and totally customizable. 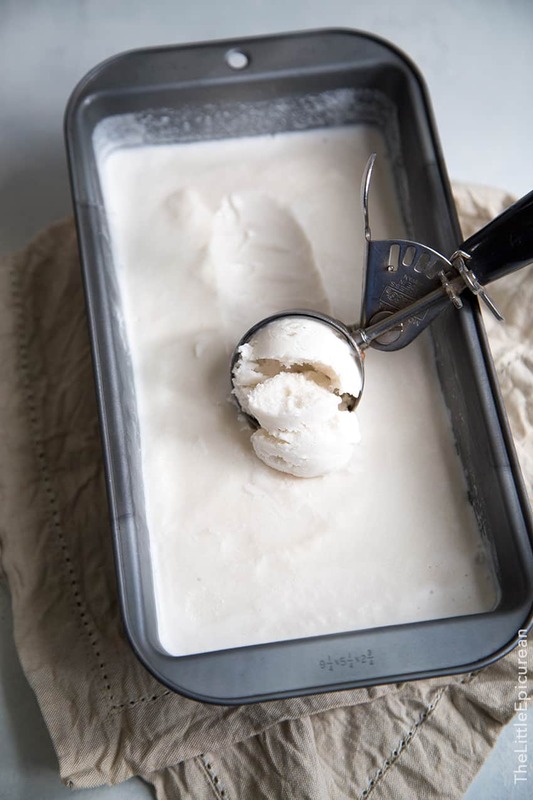 This easy to make dairy-free coconut ice cream tastes like a tropical vacation! In a blender, combine coconut milk, sugar, honey, coconut oil, vanilla and salt until sugar has dissolved. Freeze mixture in ice cream maker according to your unit's instructions. Once the volume has increased by half and has a reached a soft serve consistency, transfer mixture into a freezer safe container. Let chill in the freeze for at least 2 hours before serving. Be sure to use full-fat canned coconut milk. Do not use reduced fat/low fat coconut milk or coconut milk from cartons. These will result in icy ice cream. I use this ice cream maker. It is more expensive than the more common ice cream machines because it does not require the pre-freezing of the ice cream mixing bowl. Coconut is a favorite of mine too. It’s been too long since I’ve had any Filipino food. The local Filipino restaurants closed a few years ago and my mom’s friend no longer cooks, so I’ve been without for too long. (why didn’t my mom learn to cook when she was younger?!) I can’t wait to see how you build the sundae cones! I am also a coconut fan.your ice cream came out very well and inviting me to eat. Can we do this ice cream without using ice cream maker and how.